Several years ago I said goodbye to the programming language in which I took my first stumbeling steps as a coder. I had moved on and there were no reasons to believe I’d ever go back. I was wrong. A reason emerged and Delphi 2009 now has a place, both in my computer – and in my heart. Firing up the new IDE from CodeGear with Delphi for Win32 felt a lot like coming home. The outstanding graphical editor was there as was the lightning fast compiler. Visual Studio is great in many ways but it can’t compete with CodeGear’s RAD Studio when it comes to speed and rapid application development. The above program should produce the following output. I am not the only one being thrilled with the rebirth of Delphi. 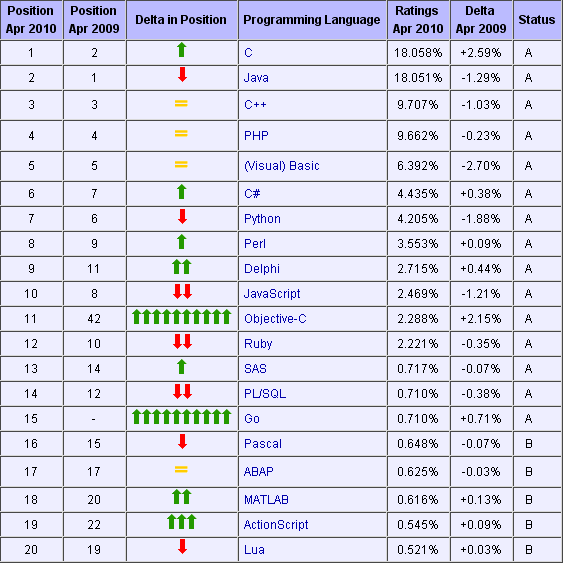 A look at the TIOBE Programming Community Index for February shows that Delphi is the 9th most popular programming language, with a steady increase. That is a lot better than the 15th position a year and a half ago. At that time Delphi felt like a marginalized language with little promises for the future; Now it feels alive and vibrant. Since the magic is back, I think I’ll stick around for a while. It’s not without sadness I see that what used to be my favorite language has taken a big dive in popularity recent years. 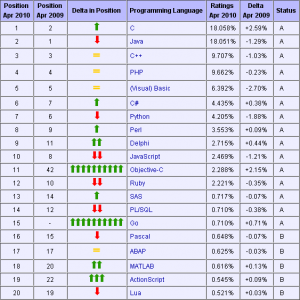 Now Borland Delphi is only the 14th most popular programming language according to TIOBE Programming Community Index as per august 2007. That is five ranks lower than one year ago, and far from it’s golden days in the mid 1990’s. Delphi was really a great language to work with. In the early days it was a strong, even leading power in the programming community. It gave us one of the first RAD environments, which sure as hell was more visual than Visual C++ and Visual Basic, its competitors at the time. But the popularity decline didn’t come as a surprise. It started with Microsoft snatching Anders Hejlsberg, the compiler genius who created Delphi’s predecessor Turbo Pascal. Following that, the increasingly lower quality releases and the name changing mess. For some unintelligible reason Borland changed its name to Inprise, only to change it back a couple of years later, most likely due to an internal revolt. Slowly but steadily even the most devoted started to leave for other, obviously better, alternatives. Last year Borland announced that they were selling all of its development tools, including Delphi. It long looked as if Delphi would be brought back under the name of Turbo Delphi, but the sale was canceled. Instead the development tools were spun off into a new company, owned by Borland. 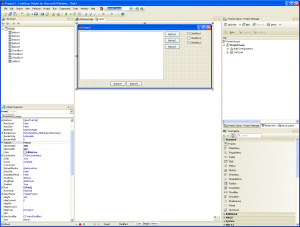 Since then Delphi 2007 for Win32 has been released, the best release in many many many years. They really did shape up, but I’m afraid it’s too late. The magic is gone and I have moved on.